Security and Privacy For Peace of Mind. Counseling Kit is designed with security and the privacy of confidential information as our top priority. 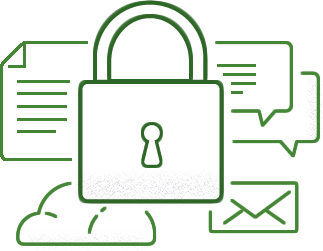 As a fully HIPAA compliant tool, you can ensure your online communication to and from clients is safe and confidential. Counseling Kit provides powerful features matched with a system you can trust. You know that ensuring the confidentiality of your client’s information is a crucially important aspect of your service. Tracking and deciphering the rapidly evolving landscape of security and compliance can be both highly technical and time-consuming task. We can help. Our technical team monitors both the guidelines of HIPAA and HiTech policies, as well as best practices in the realm of IT security to ensure that your website and client communications are secure. Redundant, self-­healing architecture, dual fiber entrances, and generator failover, providing virtually 100% uptime. Counseling Kit uses the same 128-bit encryption (for data transmission) and strong physical security (around our servers and your data) that banks use. All system activities are logged for a complete audit trail. Client files are doubly encrypted with very strong encryption. Our support and admin teams monitor HIPAA and HiTech guidelines to ensure you’re supported by-the-book.